Bring Yuletide cheer to the table with this Easy Appetizer recipe. They are fuss-free little flavor bombs of ground beef mixed the sweetness of cranberries, and a generous coating of tangy barbeque sauce. In a bowl, mix in your Garlic, Onion, Parsley, Basil, KNORR Chicken Seasoning, Eggs, Breadcrumbs, Salt and Pepper. Add in your Ground Beef, and fold all the ingredients together, using your hands. Form the meat mixture into small balls and place it on a Baking sheet with a half inch space in between. Bake it for 15-20 minutes, depending on how big your meatballs are. Pour the KNORR Barbecue Sauce in a separate bowl, add Cranberry Sauce, and place in your meatballs. Give it a quick toss until each meatball is coated in the sauce. 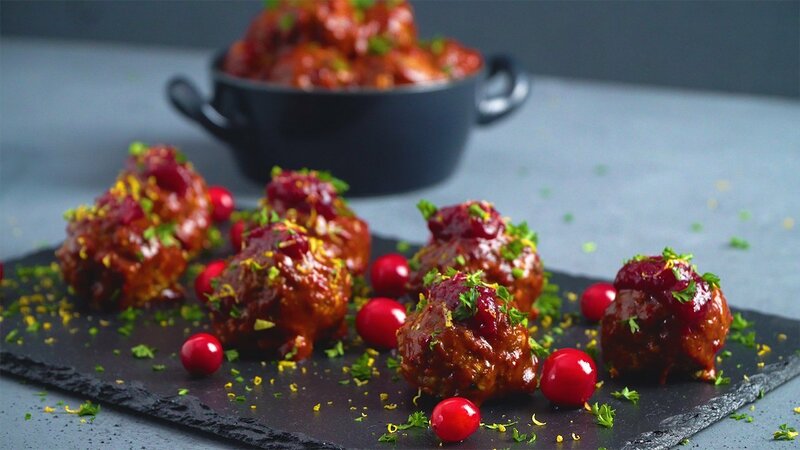 Skewer each Cranberry Barbecue Beef Meatball with a fork and serve on a decorative plate.